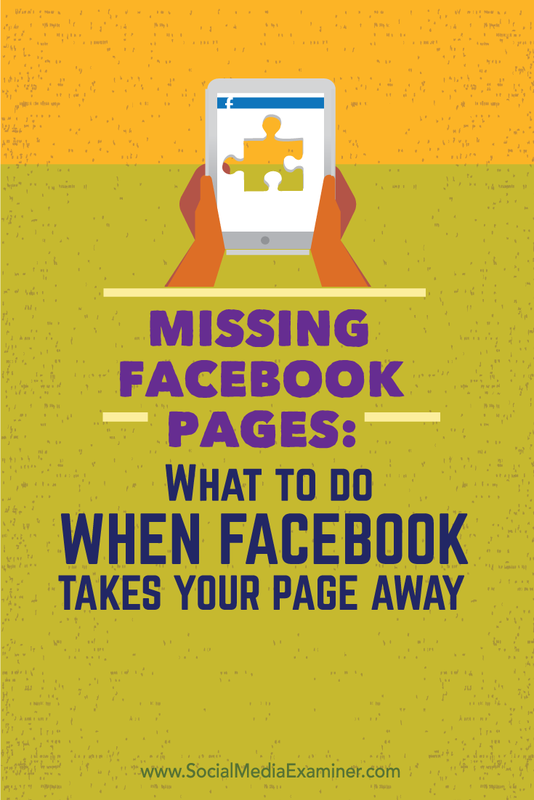 Do you know what to do if your Facebook page vanishes? Want to be ready when and if that day comes? 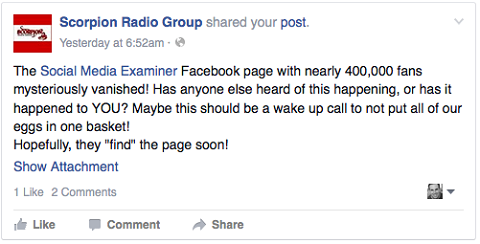 To share what happened when the Social Media Examiner Facebook page disappeared and how we handled it, keep reading. In this episode I am joined by Erik Fisher, community manager of Social Media Examiner. Erik and I will explore what happened when our Facebook page disappeared. You’ll discover what to do if the same thing happens to you. 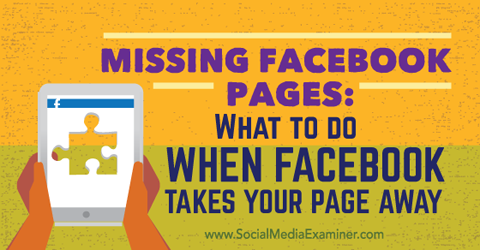 Listen as Erik Fisher and Mike Stelzner share what happened when the Social Media Examiner Facebook page disappeared. On a late Sunday afternoon with my home filled with kids and cousins and my wife cooking dinner, I eased into the couch to watch a football game. Since I drained the battery playing with my new iPhone, it was charging in another room when a text message came at 4:12 PM: “We have a bit of an emergency. Our Facebook page is missing. You around?” I had missed the text. The phone rang 12 minutes later, and my wife picked it up. Our community manager Erik Fisher was calling to tell me what happened. Between the time he texted me and when he called, Erik poked around Facebook and confirmed it. The Social Media Examiner Facebook page had disappeared. And I mean it was really gone. I even received a notification that my personal profile was incomplete because it didn’t list where I worked. Our Facebook page had simply vanished. Image: Shutterstock. I checked to see if I could view the page on mobile or on my laptop, if I could get into the admin side of the page and if the Facebook Fan widget appeared on our site. The answer for everything: no. Listen to the show to learn why it’s important to instruct your team to call you in an emergency situation. Initially, I thought we’d been hacked. Then I recalled how after I did the Chalene Johnson story we’d taken all the steps necessary to secure the accounts of all of our staff. We secured email with 2-step authentication to our corporate Gmail accounts and we turned on Facebook Login Approvals. Plus, we recently completed a security audit of everyone on our team, and have a master document of who has administrative access to what. These are all steps you can take to secure your business accounts, and you can hear more about how to implement them in the podcast. Listen to the show to hear our thoughts about “what if” the page was gone permanently. 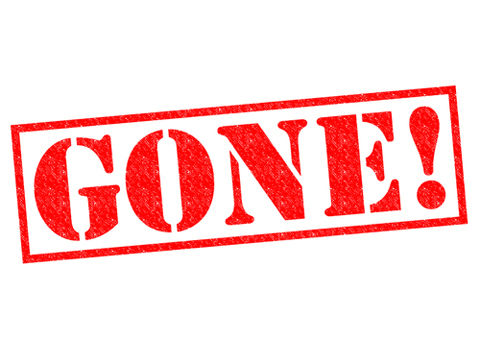 Ok friends, our Social Media Examiner Facebook page has fully disappeared from existence? Anyone have any suggestions on what to do? Initially, I decided to share it only to friends just in case there was something nefarious going on. Later on, I changed the status to public. Did your admin accounts get compromised? Are you spending enough to have a dedicated rep? Did you move it to the Business Manager? The answer to all of these questions was “no.” I searched all over to find out how to submit my issue to Facebook. I reached out to my network and someone eventually told me about the Report Pages that Disappeared form. 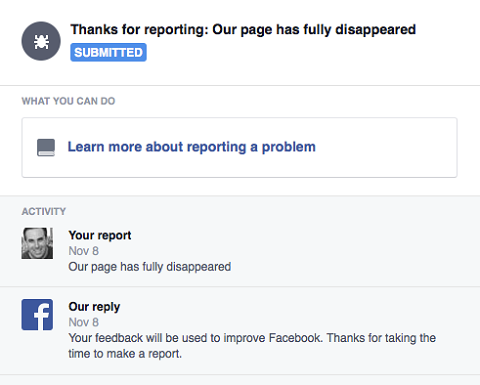 After searching for where to contact Facebook, I was finally able to report the missing page. I also found where Facebook hides its support responses. Listen to the show to discover what I determined I should have done at the beginning. I’ve been developing relationships with folks for years and I am fully aware that a lot of what happens next may not happen for everyone. However, my plan of attack could work for anyone. I reached out to all of my friends. Image: Shutterstock. Through Dennis and Dave I discovered that had I set up a Business Manager account, I could have granted access to someone who spends a lot on Facebook and they could have elevated the issue to their support managers. Find out which account information I should have documented to help me resolve this issue faster. Since it was determined that our issue wasn’t the result of negative intent, I decided to make my original post public and many other people offered to help. In addition to Dennis and Dave, Lisa Mason, Carlos Gil, Derek Halpern, Heather Dopson, Mari Smith, Christian Karasiewicz, Sean Williams and Lori R Taylor also jumped in to assist. Listen to the show to hear our strategy for getting our page back. A lot of people, like Ryan Deiss, reached out to say they’d experienced the same issue and it was resolved in about three hours. But we’d been without a Facebook page for a day and it had been 9 or 10 hours since we received the email from Facebook. I needed to find a way to take things to the next level. I started posting about the issue in of all my Facebook groups, starting with the News Media and Publishing on Facebook group, which is moderated by Facebook. A rep connected me, and I finally had my first direct communication with Facebook. I posted multiple calls for assistance. Image: Shutterstock. I posted regular “NO PROGRESS” updates on the comments of the initial post I’d made on my personal profile, and I asked everyone to share it. Mari Smith decided to share my post to the 160,000 fans of her page. I also tagged super high-profile friends like Guy Kawasaki, Robert Scoble and Gary Vaynerchuk. People were tagging and sharing it. Someone even tagged Mark Zuckerberg. More than 250 people shared that post. Run With It VA was one of many pages to share my post. The response and support was overwhelming. Like many other supporters, Scorpion Radio Group was surprised a large page like ours could disappear. I also asked all of our staff to share the post on Twitter and Google+, and plead for help. Listen to the show to discover why it’s important to join Facebook groups for your industry. If the issue wasn’t resolved by the second day, I was ready to buckle down and escalate my approach to the issue. To spur our wider audience to action, I planned to email our 425,000 email subscribers with an explanation. You might have heard about the big organic reach decline. We dealt with it. And we still updated our Facebook page a lot more times per day. And now, as of this past weekend, Facebook randomly deleted our page. Yep. They just DELETED the page. No warning. No message. Nothing. Look, despite everyone who has ever complained, I still invested in my Facebook platform. I believe Facebook has a right to build a business. I happily promote my posts. But I do not think it’s fair that a publisher can lose their page without notice on a drop of a dime and not hear anything about it for 48 hours, despite several people I know reaching out to their personal contacts within Facebook. Listen to the show to hear what hashtag someone suggested we try to get trending. 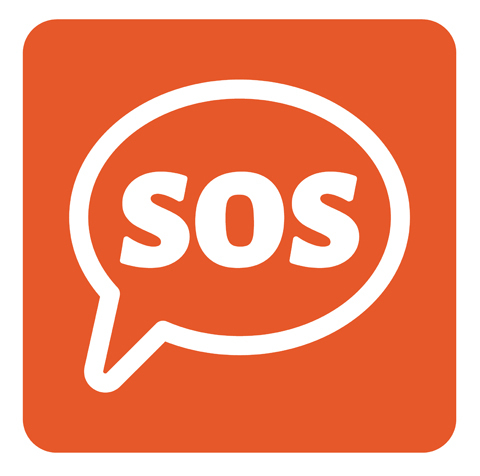 After Juan had submitted a request for help, Ana from the Global Marketing Solutions Team called his mobile phone to confirm that everything looked okay with our page and apologized for the late reply. She also sent Juan an email thanking him for reaching out and telling him to reply directly to her if we were still experiencing difficulties. Once we were back up, Erik posted the following and we got a huge outpouring of love. I shared Erik’s post with a note of my own. We had such a great response and lots of assistance in solving our Facebook problem, we told our friends and fans we’d share our experience in a podcast. Listen to find out why the last post we made before everything disappeared was ironic. Should this happen to you, I suggest you remain calm, let the process play out, engage with folks, leverage the cumulative power of your networks everywhere and encourage your team to do the same. Our frustrations with Facebook are ongoing. During this recording, our Facebook page disappeared again. There was very limited communication from anyone who could help, and zero communication about when and why it went down and so on. Listen to the show to hear what we hope you learn from the podcast. If you want to connect with other social media marketers and want to have stronger connections with your peers, sign up for Social Media Marketing World 2016. It’s the world’s largest social media marketing conference. By attending, you’ll make connections with 100+ of the world’s top social media pros (plus 3,000 of your peers) and you’ll discover amazing ideas that’ll transform your social media marketing. Hundreds of people have already purchased their tickets and have committed to coming to this conference. 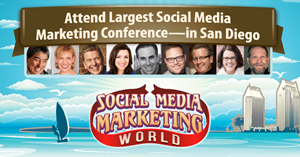 If you’ve heard about Social Media Marketing World, and always wanted to go, visit SMMW16.com. Check out the Social Media Examiner Facebook page. Listen to my podcast with Chalene Johnson to learn how to amp up your security. Learn more about Gmail 2-Step authentication. Set up Facebook Login Alerts. Sign up for Facebook Business Manager. Check out my initial post. Explore the Facebook for Business help section. Read our last post before the page disappeared. Check out Erik’s “We’re back!” post. See my “We’re back!” post. What do you think? What are your thoughts on missing Facebook pages? Please leave your comments below. 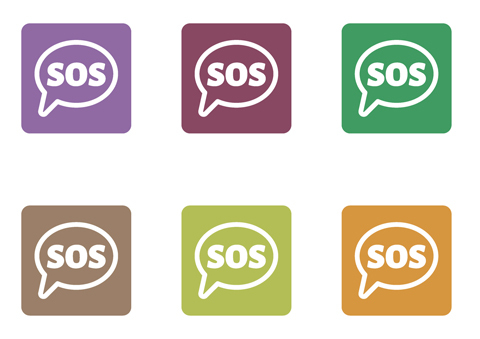 Gone photo and SOS photos from Shutterstock. 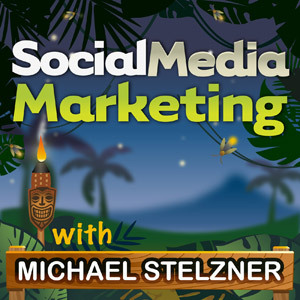 Erik Fisher talks with Michael Stelzner about missing Facebook pages.